Mach Rider is a brand new racing game for the Nintendo, with a sci-fi and action twist. 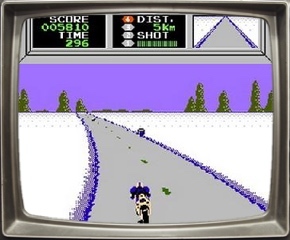 It is the second driving game on the system, after last year’s Excitebike. It does have some similarities, but the action portion of the game makes it quite different. This game offers four gameplay modes giving you several fun ways to play. Mach Rider takes place in the year 2112 on a dystopian Earth. Evil forces have taken over the planet, and it is up to you, Mach Rider, to stop them. Your hero drives a superbike equipped with a machine gun that can travel at incredible speeds through different sectors of the Earth. 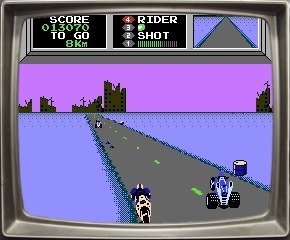 You drive vertically up the screen, as opposed to Excitebike where you race horizontally across the screen. This is more akin to arcade racers like Hang-On or Pole Position. There are four gears and you press the up or down shift to increase or decrease speed, but beware, there are no brakes! The A button accelerates your bike and the B button shoots your weapon. 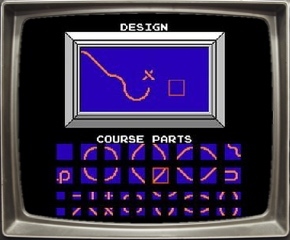 The main gameplay option is the Fighting Course. This is the part of the game that I had the most fun with, however it does present extreme difficulty. The objective is to successfully drive through each sector, while avoiding or destroying the many obstacles, all the while fighting numerous enemies that are determined to eliminate you. The first sector is kind of an introduction to the game so you shouldn’t have too many issues. However, the number of lives you get in level 2 is determined by how successful you are at getting through the first sector. I usually ended up with 3 lives, but perhaps if you’re really good you may fare better. If you crash into a rock, bomb, or an oil drum (which line the side of the road) you lose a life. You can shoot the bombs and oil drums, but have to swerve around the rocks. If you are traveling at a low speed and you bump into an enemy, you crash and lose a life. After losing your lives it is game over and there is not a continue option. For every three sectors you complete, you are awarded one extra life. The road also has tacks, oil slicks, and water spills, all of which cause you to slip and potentially crash into something worse. After completing a sector, a screen appears showing you all of the points you earned throughout the level. There are 10 total sectors listed, along with a map of your progress. The next option is Endurance Course. 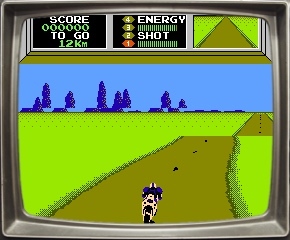 The gameplay is identical to Fighting Course, but the objective has changed. Rather than lives, you are giving a time goal on each sector. For example, you may have to complete the course in 125 seconds. If you crash, it takes time to get up and get your bike back up to speed – reducing the chance to complete the goal. The same enemies and obstacles clutter the road. As expected, the challenges get more difficult as you progress. The third mode is Solo Course. This is just like Endurance Course, but there are no enemies, only obstacles. This mode is not the most fun, but playing it will help you improve your driving skills. It is easier to learn how to maneuver on the course without other vehicles attacking you. On all three courses you are limited on ammunition, so you are not able to just blast away at everything that moves. 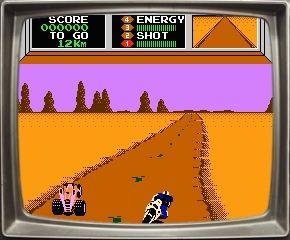 There are six different enemies that all drive identical ATV vehicles, but their color indicates how much power it will take to eliminate them. A pink vehicle only takes one shot to destroy, where a black one takes six shots. You get more points for killing off the more difficult enemies. The way to get the most points is by blocking an enemy, which means knocking them into an obstacle. You must be driving at top speed for that, otherwise you’ll end up eating dirt. You also get replenished with ammo if you can do this successfully. Points are also awarded for shooting the obstacles. I love high scores, and trying to improve upon your personal best always adds an extra challenge for me. The final option is Design Mode. This is a unique and ambitious feature, however I found it to be heavily flawed. Very creative players may enjoy this, but it takes a lot of patience. You are able to build your own course using 37 different pieces of track. It took me over 15 minutes to successfully build a course. The controls are not smooth and the entire system felt tedious to me. The worst part is there is a save feature, but that feature is not currently available. When you turn off your Nintendo, you lose the course you designed. From what I understand, in Japan the game utilizes the Famicom Disk System attachment, which allows games to be saved to the floppy disk. As this external device is not yet available for the NES, games like this and Excitebike don’t have any way to save your programmable tracks. The story of the game offers a lot of potential, but delivers very little. In between levels, adding a sentence or two about the current state of Earth, something about these evil forces, or Mach Rider’s backstory would have added a lot. The backgrounds are somewhat colorful and the sectors do look a little different from one another. In the horizon you can see decaying building in some of the sectors, which is a cool touch. The music is one short track, which loops over and over again. It is nicely composed, but after playing the game for 15 minutes you’ll long to hear something different. This game is extremely difficult, which has the potential to frustrate players. The obstacles appear out of nowhere when you are traveling at high speeds and you have a split second (if that) to avoid or destroy them. The roads are very curvy and windy and it is a constant battle to stay on course without crashing into the oil drums. It is so easy to burn up all your lives in the first few sectors that many probably won’t ever see the later parts of the game. This game should take a lot of practice for anyone to complete and master. If you loved Excitebike you should really consider purchasing Mach Rider. Anyone who loves racing and driving should enjoy this game. The mix of action and racing makes for a fun experience. Just be prepared for the unforgiving difficulty. The design mode didn’t appeal much to me, but some gamers may like it. The promise of an interesting story, then no delivery was a let down; as was the lack of variety in music. 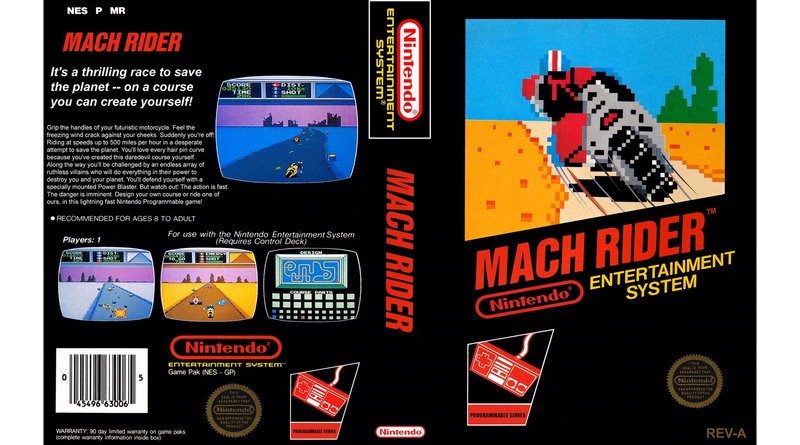 Still I would count Mach Rider as a solid game, and certainly worth trying out. Computer Entertainer awarded Mach Rider 4 out 4 for graphics and 4 out of 4 for quality of game play and entertainment value. It received a Recommended rating.